Attendees at a Bike Smart seminar in SCC came away with a reflective backpack and a wealth of information. Brentin Mosher (sitting) represents Bike Smart Tampa Bay, which promotes bike safety throughout Hillsborough, Pinellas and Pasco counties. All of us remember when we first learned to ride a bicycle. Just staying upright was the goal. Not so today; there is much more involved. 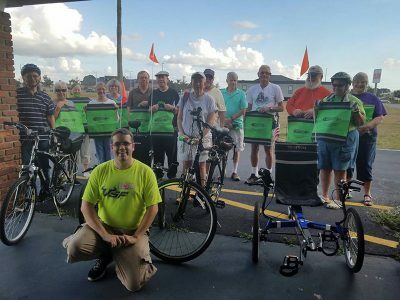 Bike Smart Tampa Bay, a regional coalition funded by the Florida Department of Transportation, takes that message out through three counties—Hillsborough, Pinellas and Pasco. Brentin Mosher, a member of the presenting team, came to Sun City Center Dec. 7 at the request of the SCC Bicycle Club. They combined the event with a bicycle registration opportunity, supervised by Hillsborough County Deputy Jeff Merry. Preparing to ride is important, he emphasized, as he demonstrated how to properly fit the bicycle and helmet to the rider. By the way, did you know you shouldn’t store your helmet in the garage? In Florida, the heat and humidity affects the foam, making it brittle and less effective. He reminded attendees that an ABC (air, brakes and chain) quick check before riding can save a lot of grief on a ride. Mosher dispensed some interesting tidbits, such as how there is a Google app that can scout a route and point out low-traffic routes. It can also track your ride and those of others. Are “U” locks better than cable? Yes, cables can be cut. Is pepper spray okay for deterring dogs? No, it can blow back on you. Some topics surfaced specific to Sun City Center issues, such as how difficult it is to hear golf carts approaching from behind, and queries as to whether bikes can ride in golf cart lanes. Yes they can. “This Bike Smart program is among the best,” said SCC Bicycle Club President Phyllis Laufer. “Their teaching technique and materials are excellent, and we hope to bring them to Sun City Center every few years.” Laufer taught bike safety for years up North, so she is sensitive to bikers acting predictably following the rules of the road. She began rebuilding the bicycle club after a former group disbanded. For information about the club, contact Laufer at suncityphilly@gmail.com.